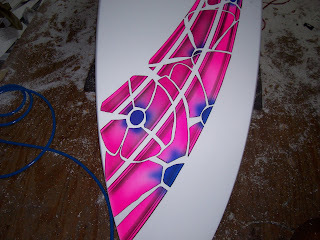 My wife wanted some pink flowers on her new board and a bit of color. 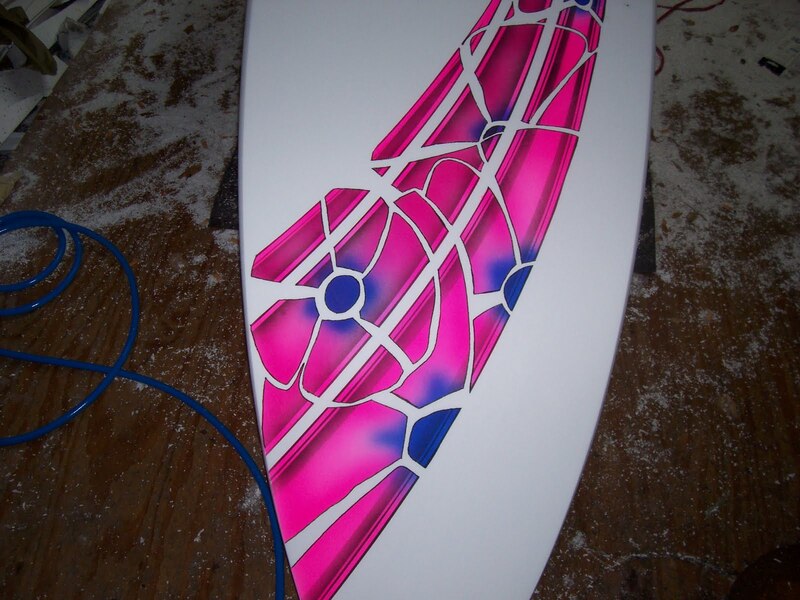 So after setting down the airbrush 10 or so years ago this is the first spray I have done since then. I decided after shaping her this sweet 9'6" round nose, round tail and looking at the shape for a while I decided that simple pink flowers would not do. 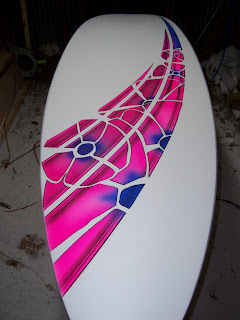 I may just sneak a few waves on this thing- how funny would it be to see a gruff old man riding a board with pink flowers on it. I'll probably get laughed out of the lineup. 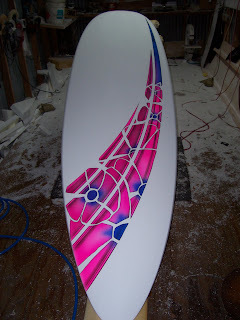 Here it is: 9'6"x 21.25"-29.75"-16.5"x4.375" with pink abstract flowers on the bottom. John, you guys are scoring out there. We had a absolutely unreal month of waves in November. I surfed overhead glassy waves for 10 days straight it was like being on a surf trip. I hope my friends hit me up with some pics for a report. It got really good here a few days. Like as world class as Florida can get. Shaping up to be a good winter. Are you kidding me! That spray looks really good- especially if you haven't been on it for that long. Great job! Hey Capt. if I make it out that way, I'm going to make a special detour out to your beach- I'd really like to surf a couple of the boards that you've put up on here. It feels good to dust off the painting equipment. Come on out with it just give me a shout before you come. I have plenty of boards, vehicles, and a extra room for you and I can cook like a 5 star chef. Sounds like I want to pay Capt Ron a visit! !